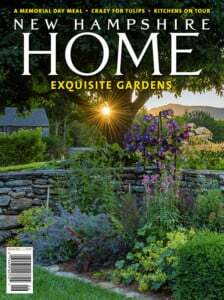 Michael Gordon, Marc Hudson and Maude Odgers are well-known garden designers who live in New Hampshire. 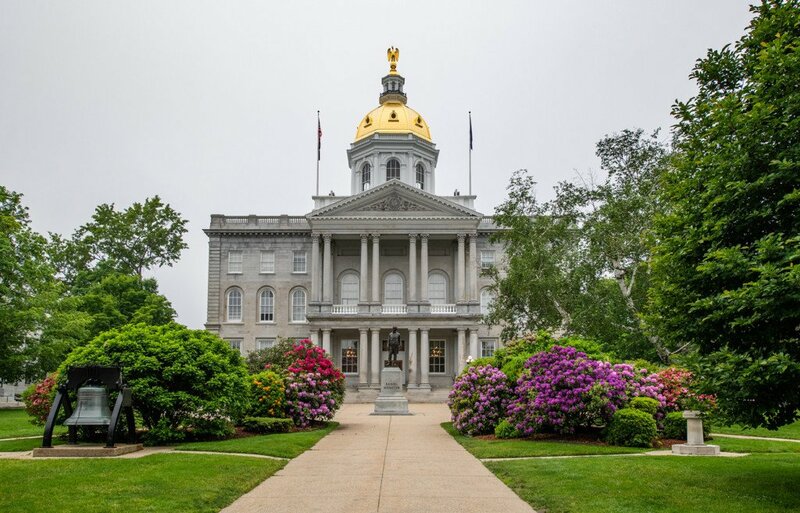 Because they’ve helped clients realize their dreams and also transformed many public gardens, New Hampshire Home asked them what kinds of plants they grow at home. As the owner of The Artful Gardener in Peterborough, Maude Odgers helps design gardens for clients as well as works alongside other volunteers to design and maintain the Town of Peterborough’s eight public gardens. As a painter and a former textile artist, Odgers has an eye for both the overall impression of a garden and the smallest details of a leaf. Beesia calthifolia (aka ‘Ginger-leaf False Bugbane’): “This is a small woodland plant with an interesting, variegated, shiny, heart-shaped crinkly leaf appealing to my love of textures,” Odgers says, adding that it has “tiny, star-like, white flowers in the spring.” It grows in dappled shade to about eight inches tall. 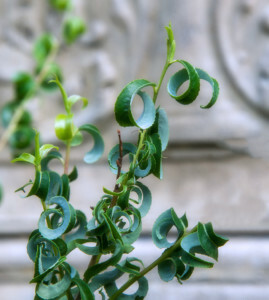 Salix babyloniska ‘Crispa’: This tree from the willow family with its distinctive, curly leaves is also called “ramshorn willow.” “It can grow to be twelve feet tall, but I cut it back to more like four feet,” Odgers says. This tree requires sun and some moisture. Michael Gordon is an optometrist with a practice in Peterborough. 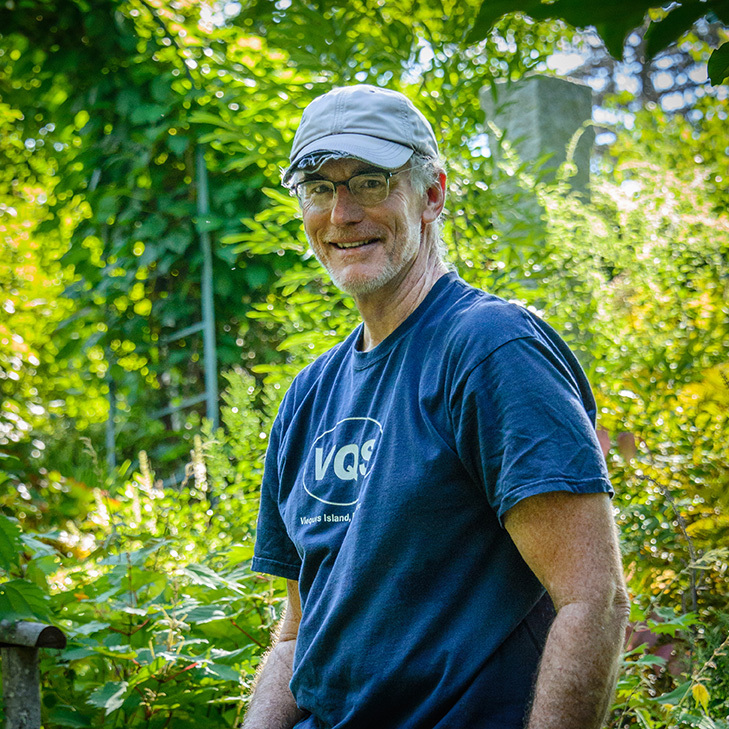 He is also a designer of public gardens. If you visit downtown Peterborough in spring or summer, you are bound to notice the handsome flower boxes on the bridge railings or the cheerful beds in Putnam Park—all due in part to his influence. 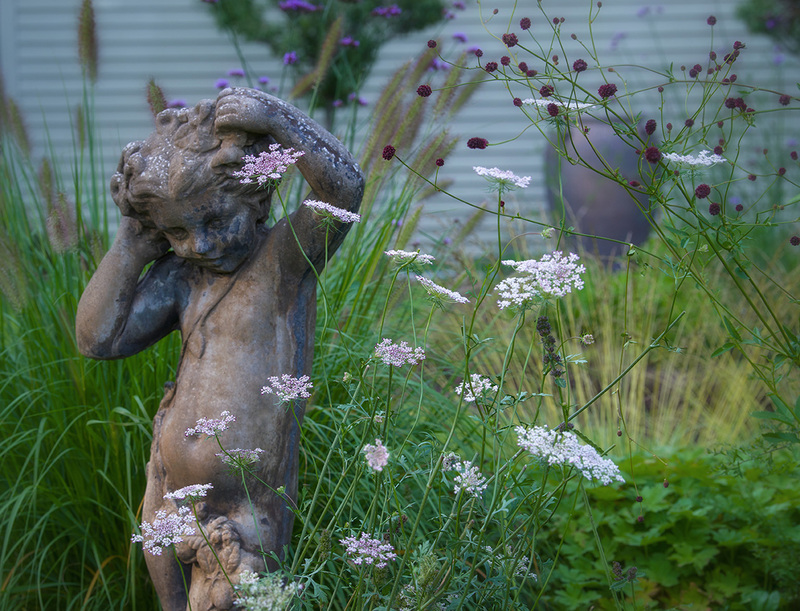 Gordon is particularly passionate about garden spaces that blur the line between public and private; he recently designed just such a garden next to the Peterborough Community Theatre for homeowner Susie Hunter (see A Hidden Gem from our March/April 2019 issue). Gordon also hosts garden tours. 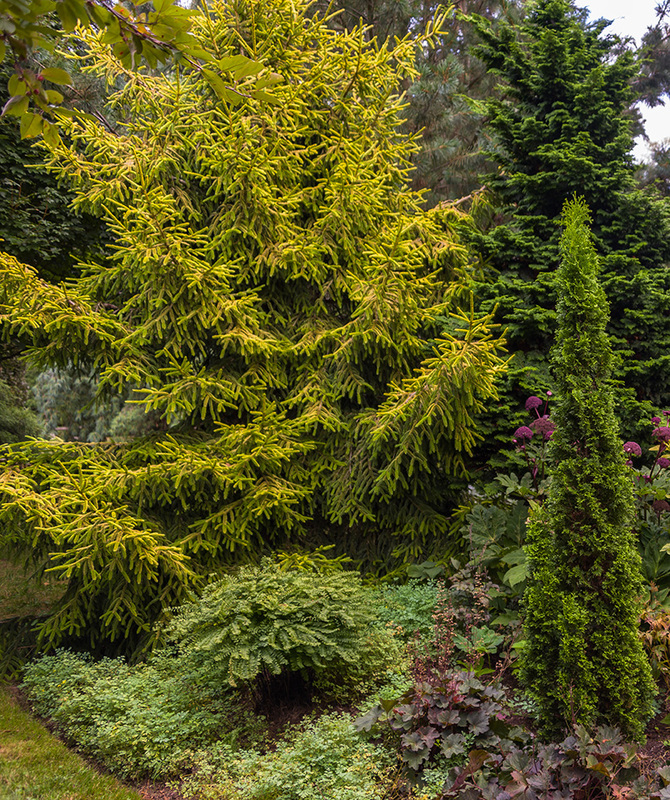 His next, “The Late Summer Gardens of Southern England,” takes place in September. 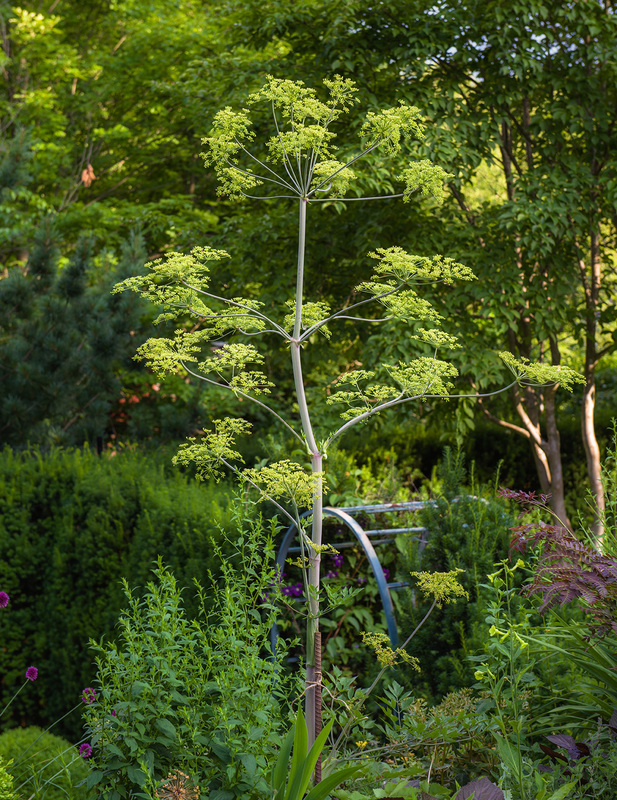 Peucedanum verticillare: “This is a biennial umbellifer that has great structure through autumn,” Gordon says. 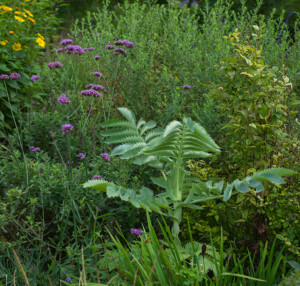 He was inspired to plant it because Piet Oudolf (garden designer for New York City’s High Line park and greenway) has it in his own garden in Holland. 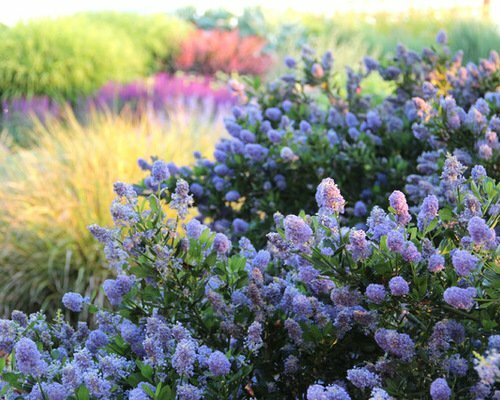 “Oudolf uses it a lot, so I wanted to try it,” Gordon says. 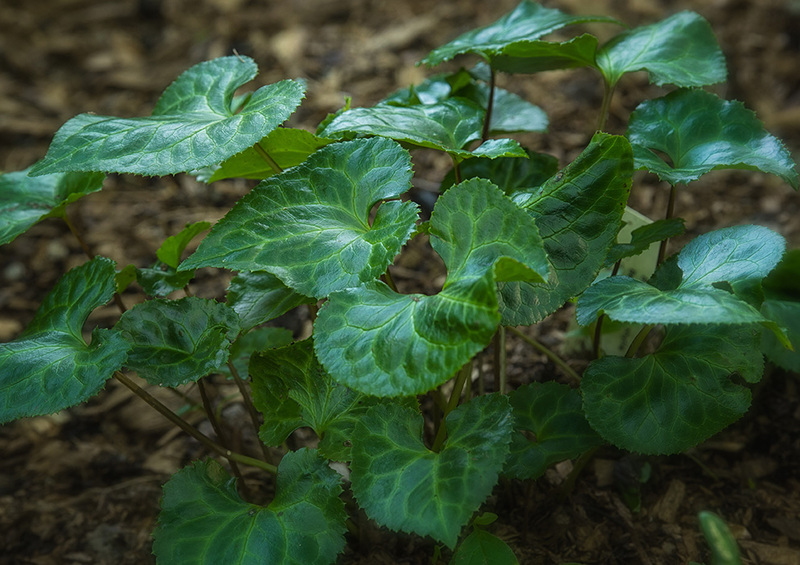 The plant thrives in sunlight to slight shade and likes a little bit of moisture in its soil. 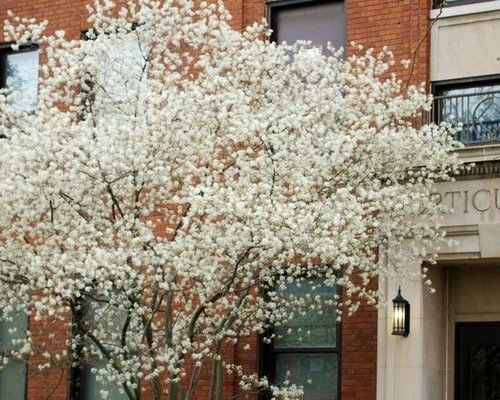 Stewartia pseudocamellia: Gordon calls this a “perfect year-round tree.” It has white flowers in June, rich red foliage in fall and “mottled bark reminiscent of a boa constrictor all year long.” Gordon propagated this tree from seed he collected at the Arnold Arboretum in Boston. 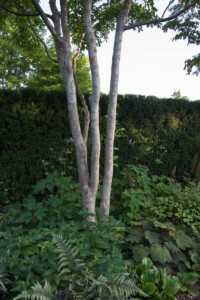 The tree grew quickly, he says, and now has “an elegant stature.” The tree is hardy in New Hampshire (zone 5), and grows well in full sun or dappled shade, such as that found at the edge of a woodland. like peanut butter.” Melianthus major tolerates a variety of soil conditions, and requires a sunny or mostly sunny location. 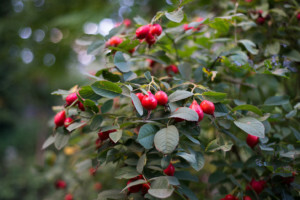 Rosa villosa: Another name for this plant is “apple rose.” According to Gordon, it is pest free. “It has glaucous foliage with amazing crimson fruit. 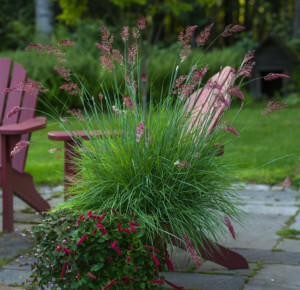 The single pink flowers are subtle but lovely.” One of his favorite things about this plant is that it looks good for the whole year, unlike many other varieties of rose, which tend to look “sad” at some point. The apple rose is able to tolerate different types of soil but requires full sun. 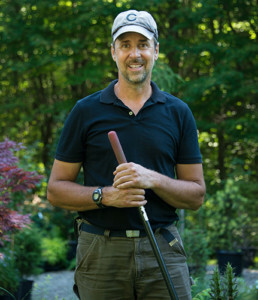 Marc Hudson has operated Inspired Gardener, a small, specialty nursery in Westmoreland, for nearly twenty years. 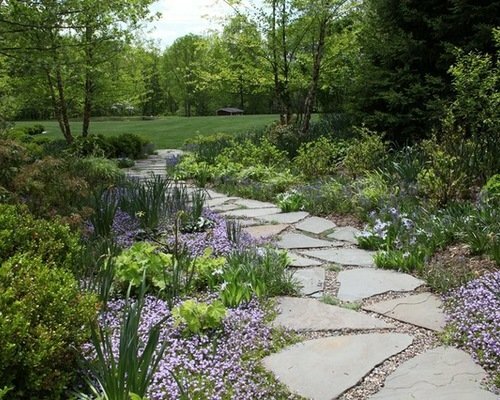 He also offers design and installation services; landscape consultations and garden care; as well as maintenance for residential and small business customers. 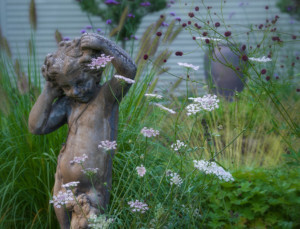 Inspired Gardener is known for its unique array of rare and unusual plants, which are enthusiastically collected, cultivated and curated by Hudson. 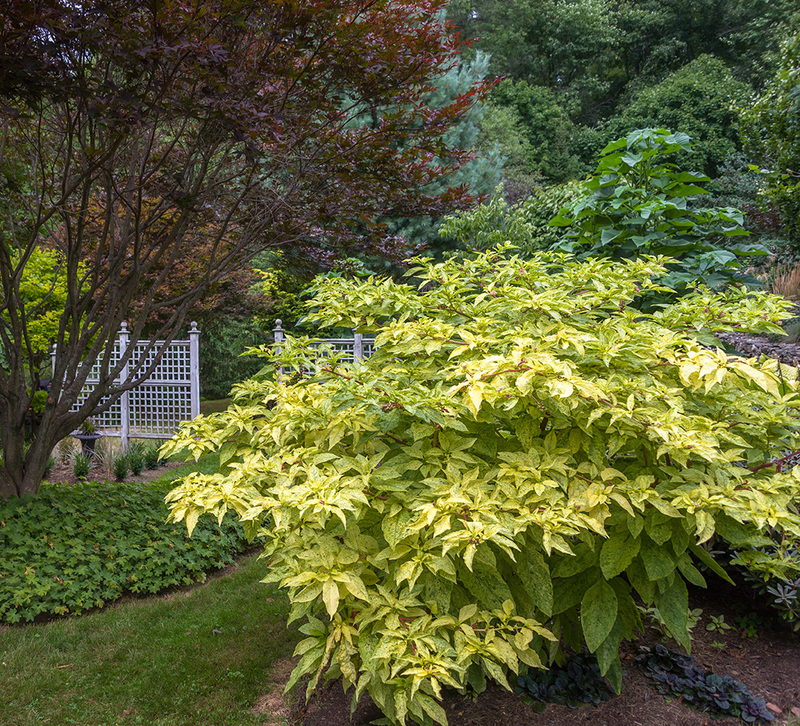 Some he discovers in other gardens—such as the American pokeweed variation pictured below that he first saw in the garden of Bill and Eileen Elliot of Hancock. 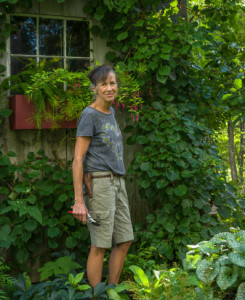 “They told me that it was a cultivar of the native pokeweed,” Hudson says, “which commonly grows in New Hampshire, often at the edge of woods and fields.” Others—such as the full moon maple (also below)—are a happy accident: “I planted this tree in my garden one October after I failed to sell it at the shop,” he says. 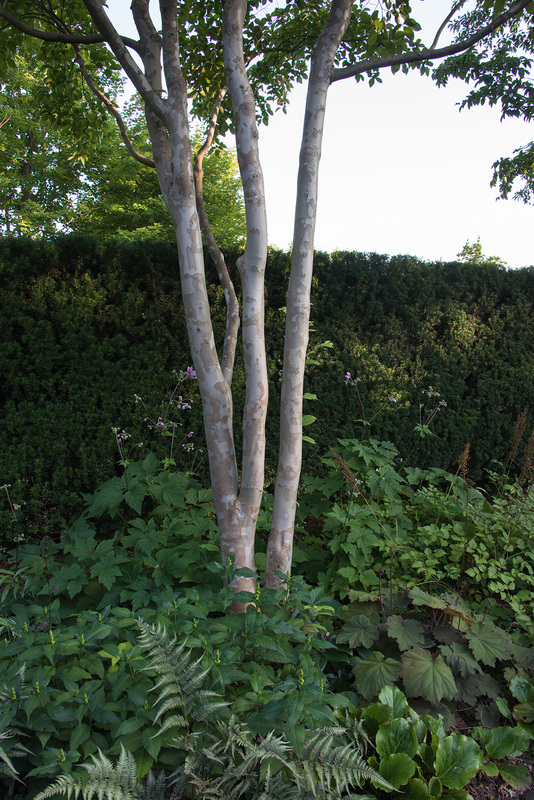 That maple, the pokeweed and an Oriental spruce are now three of his favorites. Phytolacca americana ‘Silberstein’ (American pokeweed): This plant is a standout with its variegated leaves and pinkish-purple stems, Hudson says. 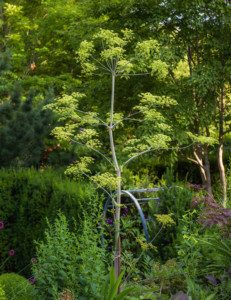 It can be hard to find at nurseries, but will readily grow from seed, which can be found online. Locate these plants in a sunny spot and give them some space, says Hudson, noting that pokeweed has a “formidable” tap root and is difficult to move once planted. “One word of caution for folks with children,” he says. “All parts of the pokeweed plant are toxic, including the showy blue-black berries, which appear in late summer.” Hudson says, however, that these are routinely consumed by birds, including robins, bluebirds, cardinals and catbirds—with no ill effects. 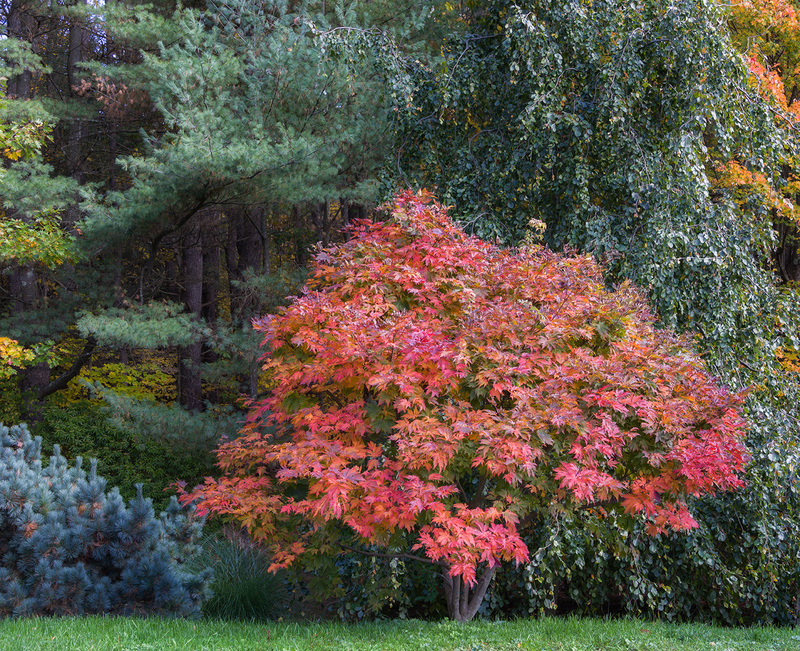 Acer japonicum ‘O taki’ (full moon maple): Acer japonicum is a species of maple native to Japan and Korea, often overshadowed, Hudson says, by the much more common Acer palmatum or Japanese maple. The tree has green foliage during summer, but in the fall, he says, “It is transformed when the leaves turn shades of yellow, orange and red.” Acer japonicum is a great choice for smaller properties, as it grows slowly, Hudson says, advising that the tree be planted in average, well-drained soil in full sun or partial shade. “It’s been a great addition,” he says.